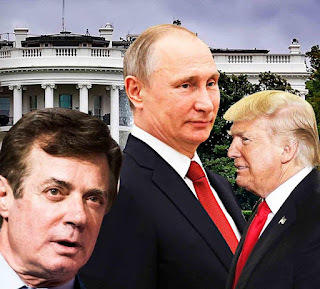 On Tuesday we learned -- thanks to a redaction error in a filing in the special counsel's investigation into Russian interference -- that Paul Manafort met with a Russian-linked operative named Konstantin Kilimnik during the course of the 2016 campaign. And in that meeting, according to special counsel Robert Mueller's office, Manafort discussed policies related to the Russia-Ukraine relationship and shared polling data about the 2016 campaign with Kilimnik. That. Is. Huge. You'll remember that President Donald Trump's constant refrain when it comes to Manafort, who has already been convicted of a series of financial crimes related to his dealing with the Ukrainian government, is that any and all charges against him happened well before he entered Trump's orbit. . . . . Which, until we got a look at the accidentally unredacted material on Tuesday, was true! Except, not now. Manafort, according to the filings, had conversations with Kilimnik, who is suspected to be a member of the Russian intelligence organization, while he was serving as the head of Trump's campaign. (Manafort's official title was "campaign chairman" but functioned as campaign manager during his time with Trump.) Those conversations apparently came even as Russian officials were hacking into the email servers at the Democratic National Committee -- which led to a series of damaging leaks via the website WikiLeaks later in 2016. 2) There wasn't even the whiff of collusion between anyone in his campaign and the Russians. On that second point, it's not clear from the filings whether or not Mueller believes that the meetings and conversations between Manafort and Kilimnik constitute collusion to aid Trump and hurt Hillary Clinton between the Russians and Manafort. But given Manafort's role in the campaign, the timing of the meetings and the Russia hacking and the unanimous conclusion of the US intelligence community that Russia interfered in the election to help Trump and hurt Hillary Clinton, there's a whole lot of reasons to suspect at least the possibility of collusion. [Trump’s] constant lamentations about the probe's lack of material evidence are belied seemingly on a weekly basis these days by release -- accidental or purposeful -- of details of the Mueller investigation we didn't know before. What we learned on Tuesday puts Manafort back at the very center of all of this. Which is a very big deal given not only his prominent place in the Trump campaign but the fact that he was one of three top Trump aides in that June 2016 Trump Tower meeting in which Russians had promised dirt on Clinton. Put simply: This latest Manafort news is a very big deal. Of course it's huge. But don't expect the GOP to bat an eyelash. Ugh.